Panasonic was the first major manufacturer to offer up an IFA press conference at the Berlin show, but the Japanese giant's focus was very much on its green efforts rather than new products. With the 60-inch Panasonic Smart Viera TX-L60ET5 headlining a paltry new product list, a larger version of a television already in the market, it was clear that this was a company focusing on streamlining rather than gloss. But its ecological message was a strong one, backed up by the company's involvement in the Skolkovo eco city project – which is aiming to create a sustainable and green town of the future for 31,000 people and uses many of Panasonic's products. 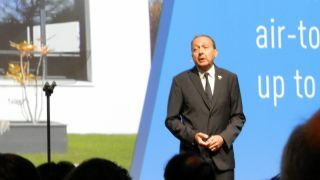 Smarter and greener was the message reverberating around the conference, and Panasonic Europe CEO Laurent Abadie was thrilled at the idea. "I am very excited about the things I will show you today," said Abadie. "It is true that smart living is now and we would like to take you on a journey." "It would be great to work together on making this change. We are ready so join us our way to make life greener and smarter." Although the products had been seen before, Panasonic did showcase some very interesting devices, including a 145 inch 8K Super Hi Vision television, a 104 inch glassless 3D television and a 20 inch 4K television.